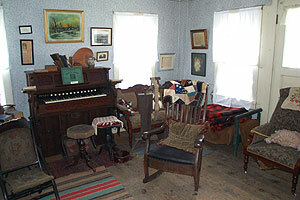 Mrs. Prescott founded the Ischua Valley Historical Society in 1966 with a group of interested citizens. She later sold the salt-box house and land to that organization for restoration and, possibly, to make it into a museum. It was first known as "Project House" but after Mrs. Prescott's death in 1978, was renamed "The Ruth Howe-Prescott House" in her honor. Currently, the Howe-Prescott House is full of antique furniture, crockery, linens, and miscellaneous items of curiosity. This area is heated by an ancient stove with a very unusual twisted stovepipe. The first floor has five rooms, furnished, and the kitchen features a wellhouse. By opening a type of Dutch door, water could be drawn from the well without going outside - the first modern indoor plumbing. Due to it's age and condition, the first floor is the only one open to the public. The upstairs is a large room, with beds/cots laid out dormitory style. There is also an unused dirt floor cellar. The barn is separaated into three main sections, the first holds tools and objects that were used during the late 1800s for farming and otehr enterprises, the center section is used mainly for storage or large farm equipment and a large display case full of tools that have been painstakingly cleaned and oiled, and the third section is set up to become a blacksmith shop in the future. The Howe-Prescott property has been the location of two flag day (June 14) celebrations. IVHS has also held a Cadiz Heritage Day event at the site. Plans are to make both annual events, as they have been so well received by the community. The barn has had significant restoration done in the past year, to keep it from collapsing. The property is open to the public by appointment only.